In the property crowdfunding market, investors have a huge range of property types to choose from. One property type that has always divided opinion is student property. Historically, some people have chosen to steer clear citing the propensity for students to damage fixtures and fittings, and the intense management needed, as not worth the headache. But with the recent staggered removal of income tax relief on mortgage interest, and higher transaction costs from a stamp duty surcharge on buy to let, the government has firmly put the brakes on the market. Now more people are turning to student property to get the returns that they desire. With that in mind, what are the underlying fundamentals of the student market and what is in store with Brexit on the horizon? 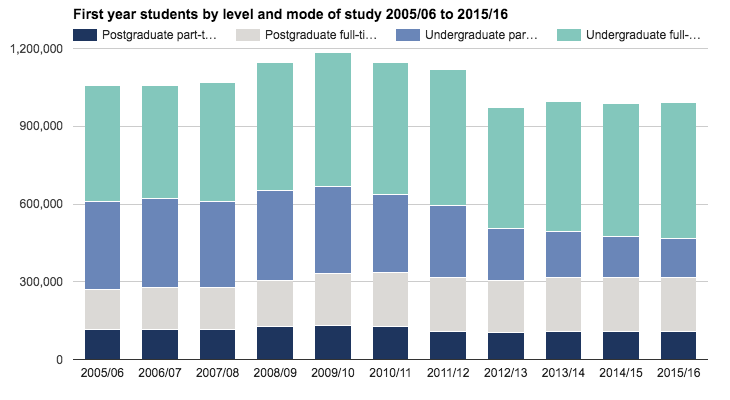 Part-time student numbers have seen the largest contraction but the very nature of these students means they do not demand traditional student accommodation. Therefore any drop in part-time student numbers is not as keenly felt in the student rental marketplace. This is also backed up by research conducted by Countrywide estate agents who found that between 2011 and 2016, the number of homes lived in wholly by students — excluding halls of residence or big blocks of student accommodation — has risen by 11,000. 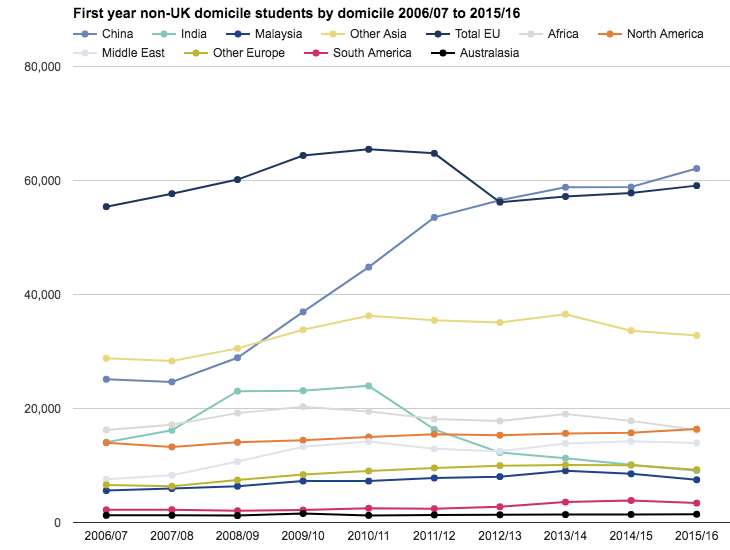 A significant proportion of undergraduate students move away from home to study. This huge migration of students would put pressure on housing stock anywhere, but when you consider that students tend to congregate in very specific areas you can see why competition is fierce. Inelasticity of supply has led to houses and flats in those areas commanding a premium. With student housing, landlords can typically achieve a yield that is 2 or 3 per cent higher than when renting a similar-sized home to a family in the same city but in a non-student area. Some of these suburbs have no space for new development so supply will remain limited and only a seismic shift in students attitudes to a given area will stop the yearly influx that keeps demands high. The creation of new wealth in Asia today has fuelled the international student market in the UK. Britain boasts some of the world’s best universities, with six ranked in the top 25 globally. More Asian students have been seeking an English-language education and this doesn’t show many signs of slowing down. The growth in the number of overseas students coming from China has been growing rapidly as they seek degrees from these highly regarded establishments. The only significant drop has been in EU students. This drop happened after the introduction of higher tuition fees and was not due to Brexit, which we will discuss later. What effect has Brexit had on the student rental market? One of the short term effects of Brexit was a sharp devaluation in the pound. Before any official changes come into effect, the weak pound will make studying in the UK cheaper for most overseas students. We can see in the graphs above that EU student numbers dropped off when tuition fees changed and as such we may see a slight increase in numbers from the weaker pound before Brexit is fully enacted. Conversely British students studying abroad will face higher education costs and may choose to study in the UK. The above is an important point. Many think that Brexit will lead the UK into recession or a prolonged period of stagnant growth. Student Housing is countercyclical and does well during a recession. That is something we know from our close partnership with The Parklane Group. It may seem slightly odd but during recessions, when jobs are harder to come by, people try to upskill by going back into education. This can help them get ahead and gain a winning edge over other people in the jobs market. Moving forward, the student market is not without its challenges with Brexit being the most immediate hurdle to overcome. In the two years between Article 50 being triggered and leaving the EU, we may see an increase in the number of foreign students due to the reasons forementioned and those trying to get in before the split. With strong fundamentals, student property is set to continue doing well and its resilience to recessions and market downturns makes it even more attractive to investors, especially those with a more pessimistic outlook of where the market is heading.